Just as you thought Robert De Niro was going to steal the show with his “F**k Trump” speech at this year’s Tony Awards, somebody trotted in, leaving a trail of astonished faces. Everybody, please welcome… a goat. 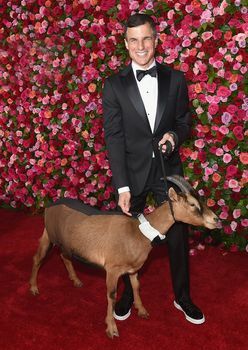 That’s right, Sparky the Goat, one of the stars of the Broadway hit Once On This Island, made his grand debut on the red carpet, looking dapper in a “flawless tailored traditional white collar with a black bow tie”. Although he was officially the date of the show’s producer Ken Davenport, he was a good sport, mingling freely with other guests like Denzel Washington, Bruce Springsteen, Amy Schumer and Glenda Jackson. The twitterati had a good laugh seeing a goat on the red carpet. As one of them put it: “Sparky the Goat is living the dream of so many humans….” You said it, pal!